Spectacular Bride features beautiful wedding decor created by Event Society. The Royal Wedding may be over, but it is still Royal Wedding Month here in Las Vegas — and we have a lavish setting that is fit for a King and Queen! For our 2018 photo shoot, Spectacular Bride Magazine teamed up with Event Society at the beautiful Casa de Shenandoah to create an opulent wedding setting that is perfect for the royal wedding of your dreams! 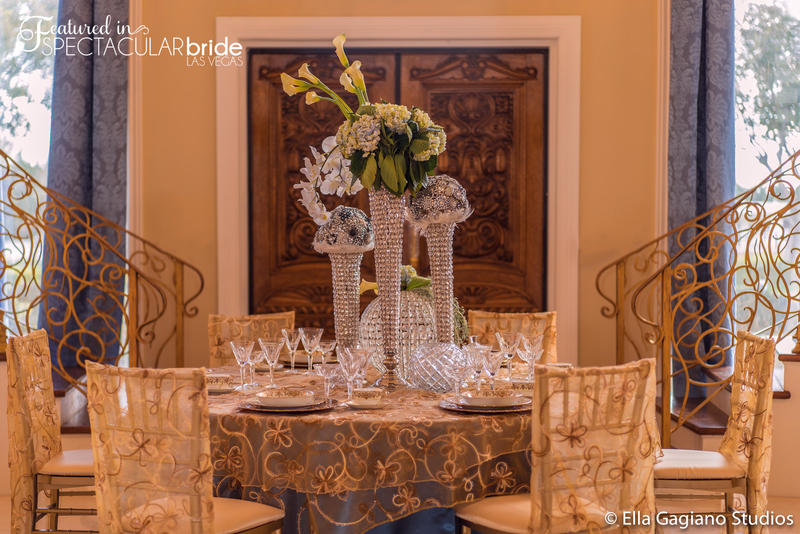 This plush setting features a gold and crystal motif, including golden table linens and chair sashes, gold tableware, crystal glassware and vases, and sky-high crystal centerpieces finished with white orchids and canna lilies. Our fantastic photographers, Adam Frazier and Ella Gagiano Studios captured this wedding display flawlessly — we hope you enjoy!